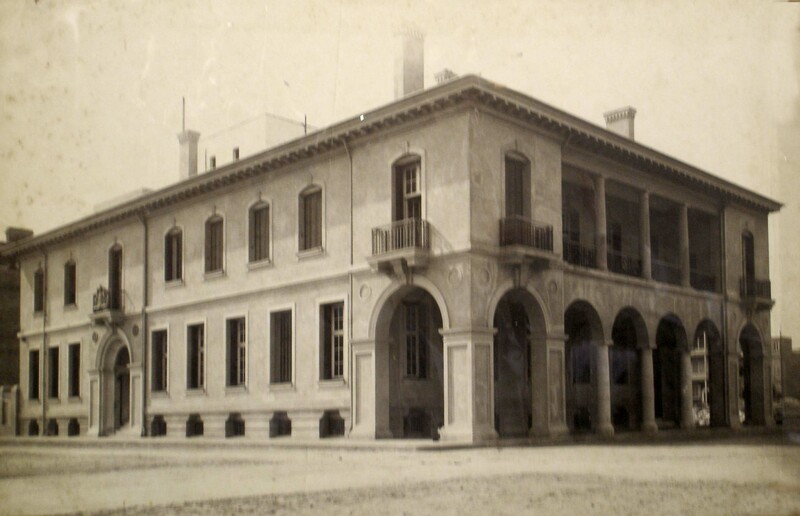 By 1903, the leased consulate-general building was inadequate for its purpose. The Foreign Office was resisting putting the consulate into the agency building because the location would be wrong for it: the consulate-general ‘ought to be in the immediate neighbourhood of the police office and of the hotels’. Herbert Willis, the Office of Works’ architect at Constantinople, was sent to Cairo in October 1903 to report: he concluded that buying a site and building a new consulate and residence was easily the cheapest solution. The Treasury quickly agreed, provided that payment could be deferred until after 1 April 1904. In consequence, a site of 688 square metres was bought in the Ismailia quarter, on Rue Gameh Charkass, for £3,350 from the Banque Industrielle d’Egypte in 1904. Willis straightaway prepared a set of plans which were heavily criticised by Arthur Alban, the acting consul-general. 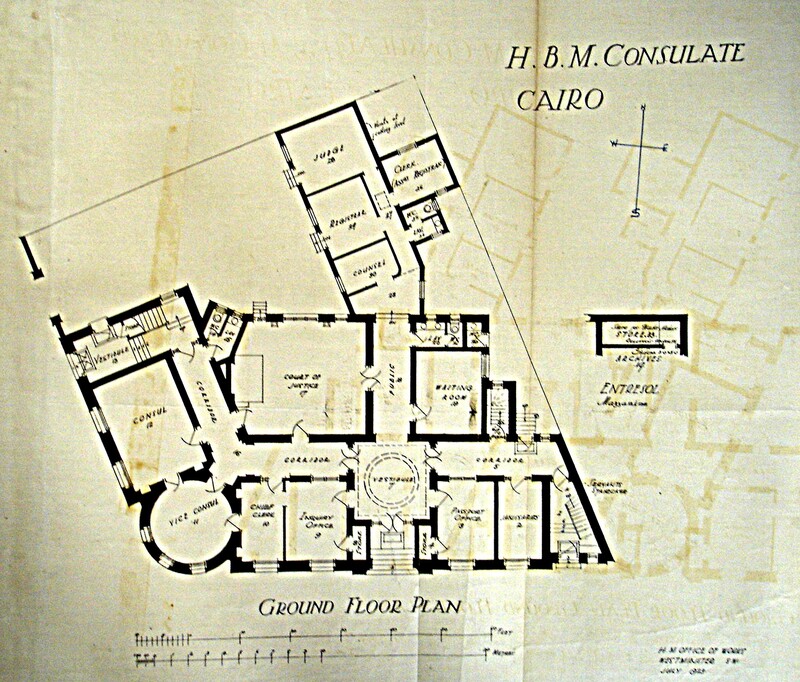 Henry Tanner, principal architect in the Office of Works, visited Cairo in April 1905 to assess the arguments and he submitted revised designs in August 1905, which were accepted. The court and its offices were on the ground floor, consular offices on the first, and the consular residence on the second. Tanner had hoped that the local Public Works Department would measure the quantities and arrange the tender. The Director, however, informed Cromer that ‘I would infinitely rather have nothing whatever to do with this work beyond placing any information we have at the disposal of the officer deputed by the Board to carry out the work’. In the event, one of his staff, Clifton, did help quite a lot. Frederick Huntley returned to Cairo as the resident architect and Adair was taken on as Building Superintendent. Construction, by Sabatelli, was completed in 1907 at a cost of around £9,000, a considerable excess over estimate. The consulate-general continued to occupy the building until it moved into the new embassy offices building, and it was sold in May 1956. The district of Zamalek, comprising the north end of Gezira Island, was an affluent residential suburb throughout most of the twentieth century. Five large, light and airy senior staff houses here were more liked by their occupants than perhaps any others in the diplomatic estate. Some of them had been leased from the Egyptian government, their owner, by senior staff before the Second World War. In 1947, the Egyptian government offered them for sale to the British government, an arrangement that was finalised in 1949. They were: 19 and 20 Shari Ibn Zanki, opposite each other (occupied in 1951, respectively, by Head of BMEO and minister); 4 and 16 Shari Shagarat El Dor (occupied in 1951, respectively, by a first secretary and consul-general); and 25 Sharia Gabalya (formerly 21 Sharia El Mansour Mohamed, adjacent to the minister’s house and occupied by a first secretary). During the late 1950s break in diplomatic relations the Egyptian police occupied several of the properties. Egyptian ministers and their senior staff migrated to Alexandria for the June-October period when Cairo was unbearably hot. The British mission went too. It was accustomed to renting suitable premises but Sir Eldon Gorst made a sufficient case in 1909 for buying a site and building a permanent summer residence. Accordingly, later that year, a site of about 0.3 hectare was bought from the Alexandria Water Company for about £1,000 at Ramleh in a district called Roushdie, about five miles east of the centre of Alexandria. A two-storey house with a pleasing plan, including offices for chancery, was completed on this site in 1912 for about £10,000. Use of it, however, was contentious from the start. Gorst departed from Egypt before it was finished. His successor, Lord Kitchener, thought it inadequate and never occupied it, and it was let to the Red Cross instead. Sir Henry McMahon, who came next, wanted a different summer residence in Ramleh, and his successor, Sir Reginald Wingate, preferred to look for an alternative of ‘sufficient importance’. During the periods that Ramleh was being thus boycotted, a large rented house called Villa Zervudachi generally served as the summer residence. Allenby, who succeeded Wingate in 1919, wanted to move the chancery out of the house and to use it purely as a residence. 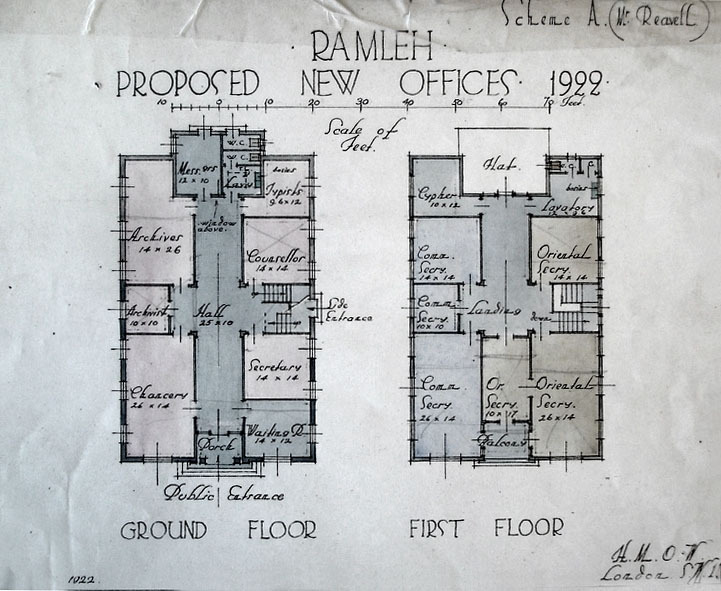 The Ramleh site was therefore enlarged in 1922 (though the acquisition deed was not signed until 1926) with the further purchase from the Alexandria Water Company of an adjoining 0.45 hectare for £2,023. Willis, the Office of Works architect /surveyor at Constantinople, designed for this site a simple rectangular two-storey building for offices in approved official style. It was first occupied in June 1923, having cost about £8,500. In 1925, fearing over-development in the area, the British government asked the municipality to buy the site opposite the residence as a public garden: the municipality obliged upon receipt of a British contribution to its purchase. Sir Miles Lampson, who served as high commissioner and then ambassador from 1934 until 1946 (and was raised to the peerage as Baron Killearn in 1943), appears to have used Ramleh little before the war. He put it at the disposal of the admiral commanding the Mediterranean fleet during the war, and not long afterwards the annual migration of the Egyptian government to Alexandria, and the consequential move of ambassador and selected staff, gradually wound down as air-conditioning became more available in Cairo, and ceased in 1952. At the north end of the Suez canal. 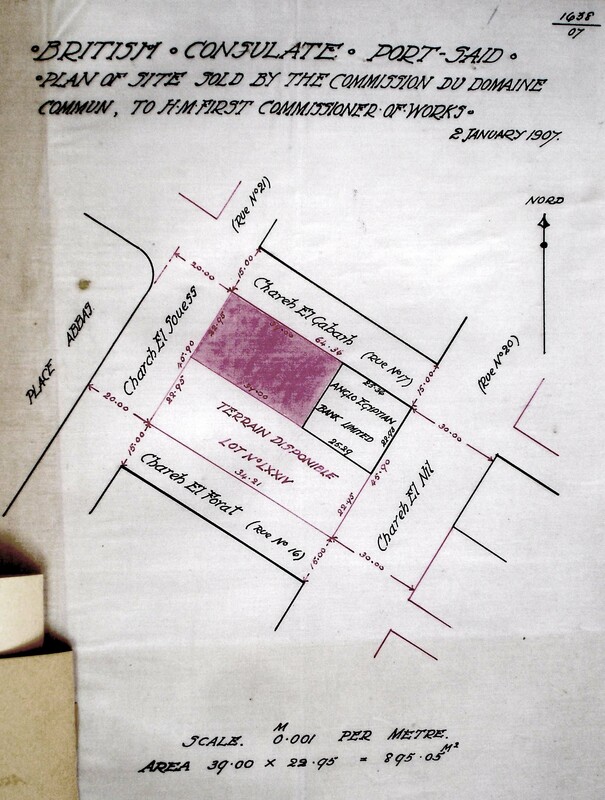 A small piece of land, 895 m², on the corner of Shari el Jouess (Rue 21) and Shari el Gabarti [?sp] (Rue 17), was bought from the Commission du Domaine Commun in 1907 for £3,067. To ensure an harmonious development of the street, the vendor required as a condition of sale specified storey heights and an obligation to build an arcade at the Shari el Jouess frontage to dimensions determined by the Egyptian Works Department. Such a building was designed by the Office of Works in London, either by Thrift Reavell or under his immediate direction, and completed on site in 1910 at a cost of about £11,500. This building lost its purpose in 1957 with the closure of the canal but re-opened in 1965 as the British Shipping Office. It was completely gutted by looting and fire two years later during the Six Day War: the British government subsequently entered a claim for £46,000. The property was finally sold in 1968. At the south end of the Suez canal. 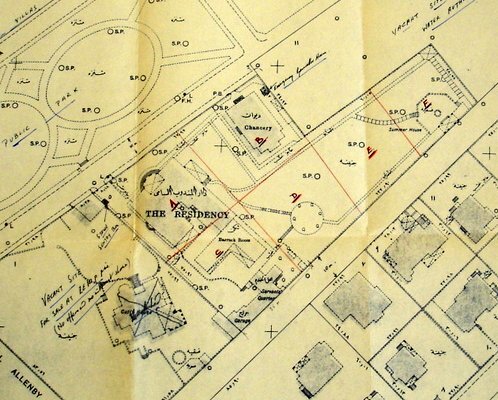 A site of 900 square metres on Avenue Helene was bought in 1939 from the British India Steam Navigation Co Ltd for £5,400, with a view to building vice-consular offices and a residence on it. 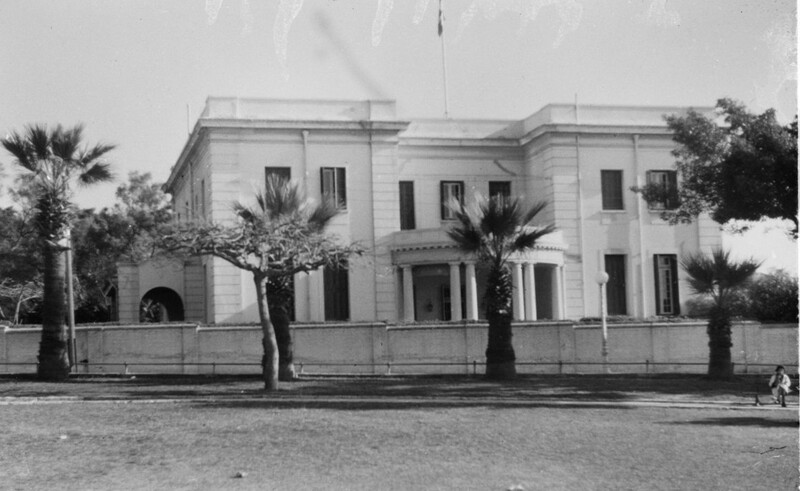 The Ministry permitted the vice-consulate’s current landlord to erect temporary offices on the new site during the war, and then leased these buildings itself for four years from 1943. The decision to build was taken in 1949, sketch plans, without air-conditioning, were agreed in 1950, and the new building was completed in 1956 as consular and shipping offices and a consul’s flat. By the mid-1960s, the ground floor was let to an Egyptian shipping firm and the first floor was used by a visiting consul and as a recreation flat by Cairo staff. The building was severely damaged by shells from Israeli guns during the 1967 Six Day War, and submission of a claim was contemplated. The property was finally sold in 1968. 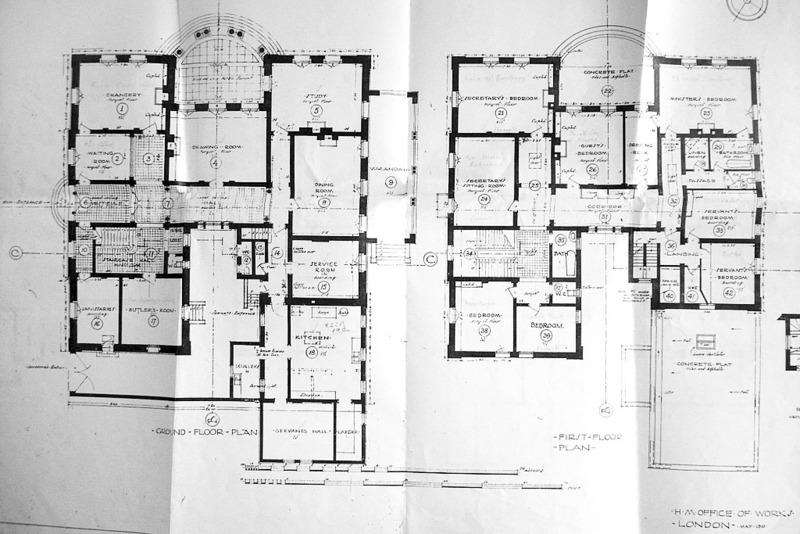 1923 ground floor plan of consulate-general building, completed 1907. 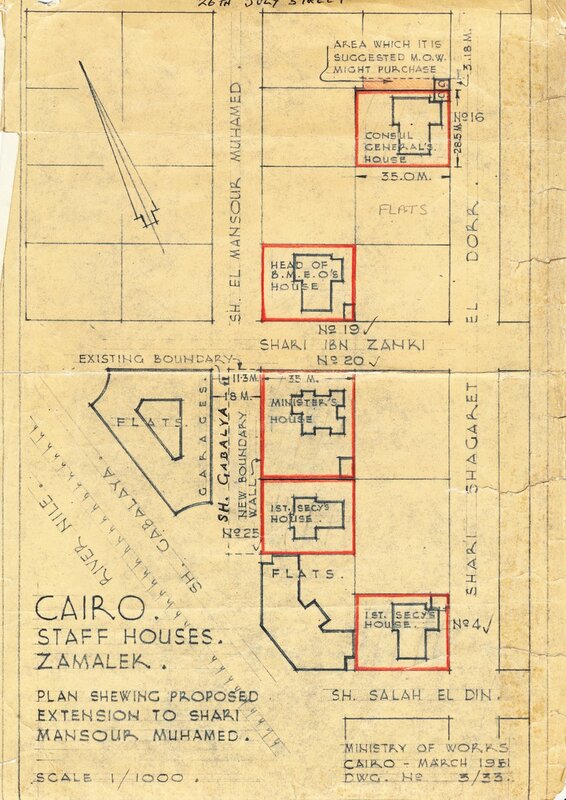 Relative locations of the five freehold senior staff houses in Zamalek, 1951. 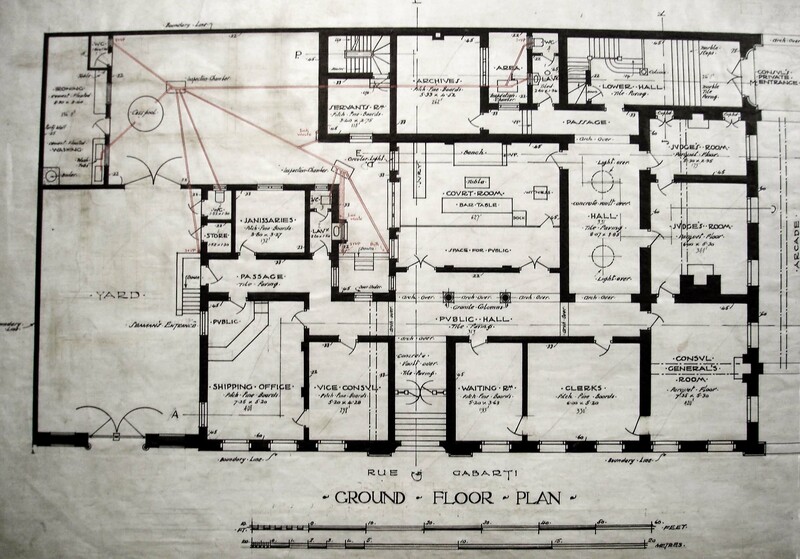 1925 ground floor plan of summer residence, built 1912. 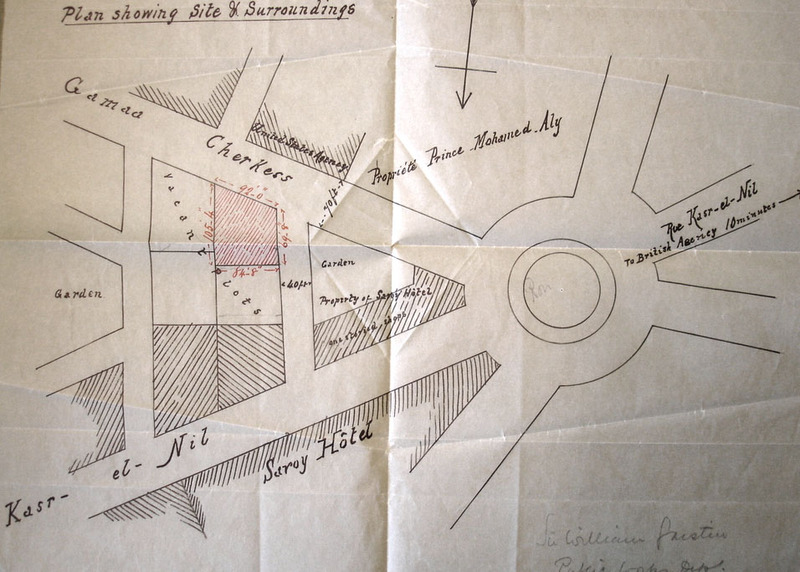 Location plan of summer residence, separate offices and public park opposite, ?1920s. Plans of small office building, 1922. 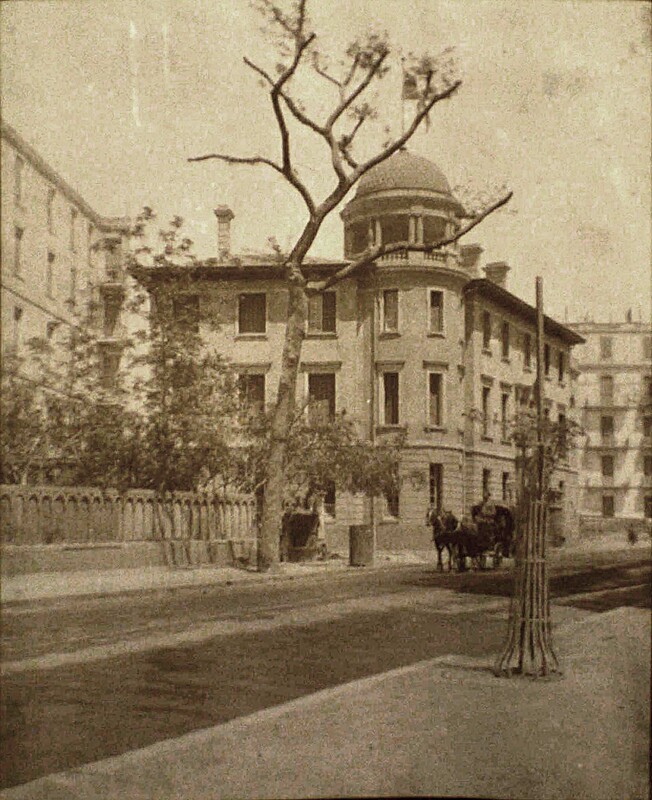 Completed consulate building, c. 1910. Ground floor plan of Port Said consulate building, 1909.